However, it’s easy to be overwhelmed with all the packaged treats on the market -- cranberry apple muffins, tuna escapade, salmon delight...With so many options, how do you choose the right treats for your dog? After all, there are training treats, dental hygiene treats, long-lasting treats, and on and on. Plus, there's lots of treats you can make! It turns out, it DOES matter what types of treats you choose for your pet. Not only that, but you also should pay attention to how many treats you dole out in a day. After all, treats are meant to be “extras,” not meals unto themselves. One of the biggest considerations when it comes to treats is caloric content. A very general veterinary recommendation is that treats should not be more than 10% of your dog’s diet. This means, if you’re feeding high-calorie treats, it may only take one or two before your pup has reached a healthy limit. Of course, that doesn’t mean your dog will want you to stop giving him treats, so be prepared for puppy dog eyes! Sometimes, of course, repeated treat-feeding is necessary. Take, for example, training treats. Whether you have a new puppy or a new-to-you dog that you’re training, these small treats can be super helpful for your dog’s cooperation. They’re small because they’re meant to be fed rapid-fire so you maintain your dog’s attention. They’re usually soft, which makes them easier to gobble down, and this can also make them easier to break into smaller pieces. 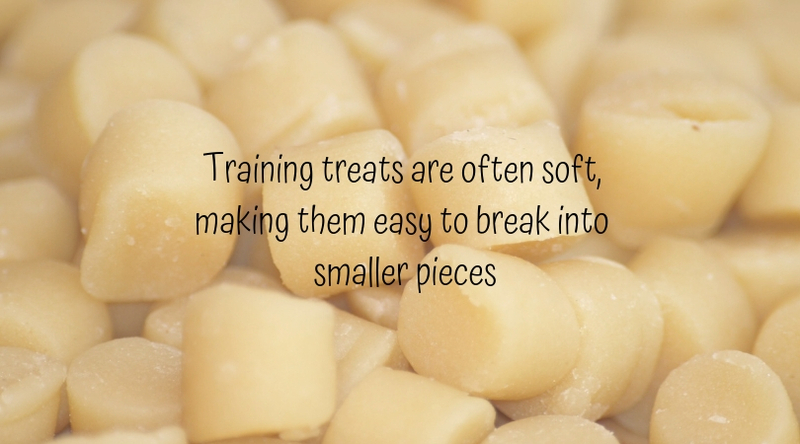 Even training treats can still be too large - especially for small dogs. It can also be useful to add in low-calorie treats, like baby carrots and frozen green beans, to help keep your pup’s treat calories lower. Many trainers will tell you to use high-value treats during training sessions to get - and keep - your dog’s attention. Bits of cheese and cooked chicken fall into the category of “high-value.” Ideally, your dog will be receptive exclusively to low-calorie treats, but if this isn't the case, you'll need to monitor treat intake very closely. No matter which types of treats you offer, for your pet’s health, it’s important not to go overboard. If you’re doing a lot of training with treats, then you’ll likely want to cut back on your dog’s dinner portion. After all, you don’t want Max to put on too much weight, as that leads to health problems. How much to cut back will vary depending on your dog’s age, size, activity level, and of course what type of treats you’re giving. Your veterinarian is your best resource in this regard. Talk to our team to help determine the best portion sizes for your pup. Of course, treats aren’t just for training. 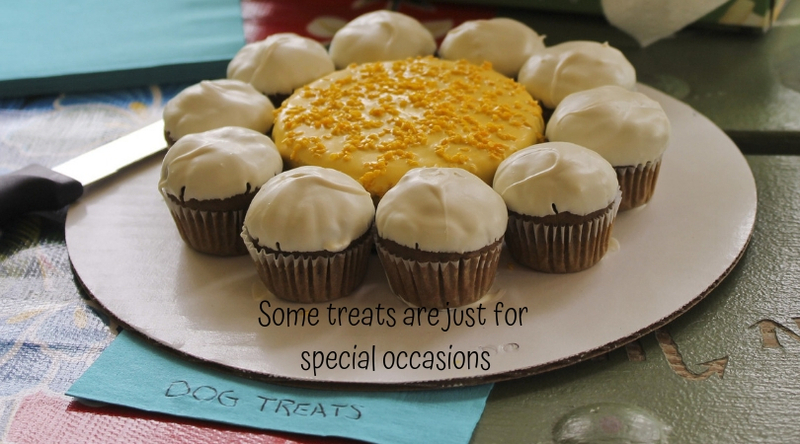 There are lots of other types of treats meant to reward your pet, too, including dental treats. There are a variety of dental chews you’ll find designed to clean tartar. Many veterinarians recommend them as a supplement to regular tooth-brushing to help clean your dog’s teeth between dental cleanings. It turns out that dogs who are active chewers often have cleaner teeth, and, since dental chews are designed for chewing, these treats can help. The Veterinary Oral Health Council has a list of products they accept for pet dental health. What About Antlers or Hooves? Dogs might love antlers or hooves, but they get mixed reviews from veterinarians, with many doctors saying they’re downright dangerous for dogs. It turns out the hardness of the material can lead to broken teeth, and sharp points can lead to mouth injuries. These issues can lead to expensive dental work or painful emergencies. We recommend that you discuss these types of treats, plus any alternatives, with your veterinarian. Have you ever stood at the "barkery" counter mulling over the array of beautiful pupcakes? They do make gorgeous items. However, it’s a good idea to limit these to very special occasions, like birthdays or other special holidays. There are lots of different types of treats for your dog. The best ones for your pet will be dependent on factors such as age, feeding frequency, and activity levels. If it’s just a tasty tidbit to show your love and affection, then most any of the treats on the market will probably be fine. Just don’t load your dog up with them. Be open to low-calorie veggie treats, too, to help your dog maintain a healthy weight. Most importantly, be sure to talk with your veterinary team for specific nutritional recommendations. We can help you make treat time less tricky for your dog's health!